Is CBT all it claims to be? 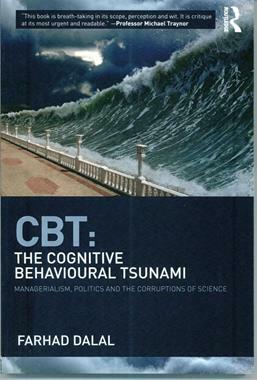 CBT: The Cognitive Behavioural Tsunami: Manage-rialism, Politics, and the Corruptions of Science provides a powerful critique of CBT’s understanding of human suffering, as well as the apparent scientific basis underlying it. The book argues that CBT psychology has fetishized measurement to such a degree that it has come to believe that only the countable counts. It suggests that the so-called science of CBT is not just ‘bad science’ but ‘corrupt science’. The rise of CBT has been fostered by neoliberalism and the phenomenon of New Public Management. The book not only critiques the science, psychology and philosophy of CBT, but also challenges the managerialist mentality and its hyper-rational understanding of ‘efficiency’, both of which are commonplace in organizational life today. The book suggests that these are perverse forms of thought, which have been institutionalised by NICE and IAPT and used by them to generate narratives of CBT’s prowess. It claims that CBT is an exercise in symptom reduction which vastly exaggerates the degree to which symptoms are reduced, the durability of the improvement, as well as the numbers of people it helps. To purchase the book at 20% discount use this link www.routledge.com/9781782206644 <http://www.routledge.com/9781782206644> and enter the discount code BSE19 at checkout.